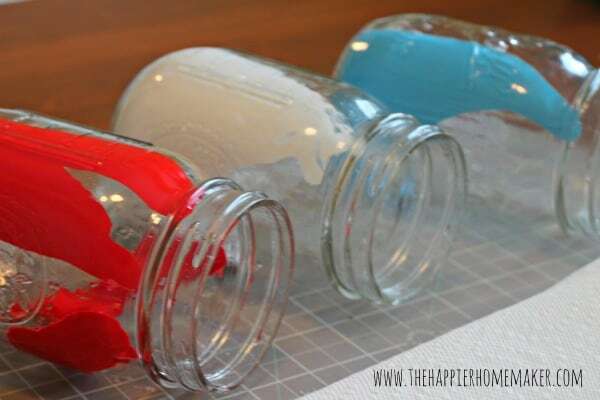 When it comes to decorating for the Fourth of July, all you really need are mason jars to create memorable centerpieces with patriotic flair. Mason jars are inexpensive, readily available and you probably have an entire cabinet full of them in your kitchen. These DIY crafts make perfect party décor for any Fourth of July celebration — you can even use them as take-home gifts! Step 1: Paint two jars white and one blue using acrylic paint. Then, tape off the stripes on two jars using washi tape and paint the exposed portions red. Step 2: Use a star stamp dipped in white paint to add stars to the blue jar. After the paint dries, give your jars a coat of clear enamel spray paint and then distress the finish using sandpaper. Step 3: Make several groups of three so they can be used for different purposes. Fill some with flowers and/or small American flags, use some to hold utensils and straws and put tea lights in others to create lanterns. Light up your Fourth of July celebration with this unique mason jar lantern. You need quite a bit of hardware to pull this off, but it’s still totally DIY. Plus, you can use it year-round or at least keep it stowed away for next July 4. Step 1: Nail the two 12-inch slats to the underside of the 6-inch-by-12-inch wood piece to make a tray of sorts. You’ll need enough room, an inch or so, to clear the cords that come out of each jar of lights. Step 2: Measure and mark holes for the rope handles on either end of the board and then drill the holes. Step 3: Position the lids of the jars on the flat side of the tray. Once they’re evenly spaced and centered, mark the center of each one on the wood with a pencil. Step 4: Use a large drill bit and a sanding tool to make holes large enough to fit the lights through. Step 5: Coat the top and sides of the tray with the gray spray paint. Allow it to dry completely. Step 6: Add the rope handles by knotting the twine on the underside of the tray. Step 7: Use the craft glue to attach the bands of the mason jar lids around each hole (you won’t be using the inner portion of the lid on this project). Step 8: Paint the stars with the red and blue spray paint. After they are completely dry, glue them along the edges of your tray. Step 9: Screw your mason jars into the bands. Flip the board over, standing it on the mason jars. Step 10: Divide the lights into three equal parts (there are 20 lights on each strand so seven, seven and six makes it even enough). Shove the lights through the large drilled holes and into the mason jars. Step 11: Flip the project back over, plug in your lights and voila! How about something sweet for your buffet table? 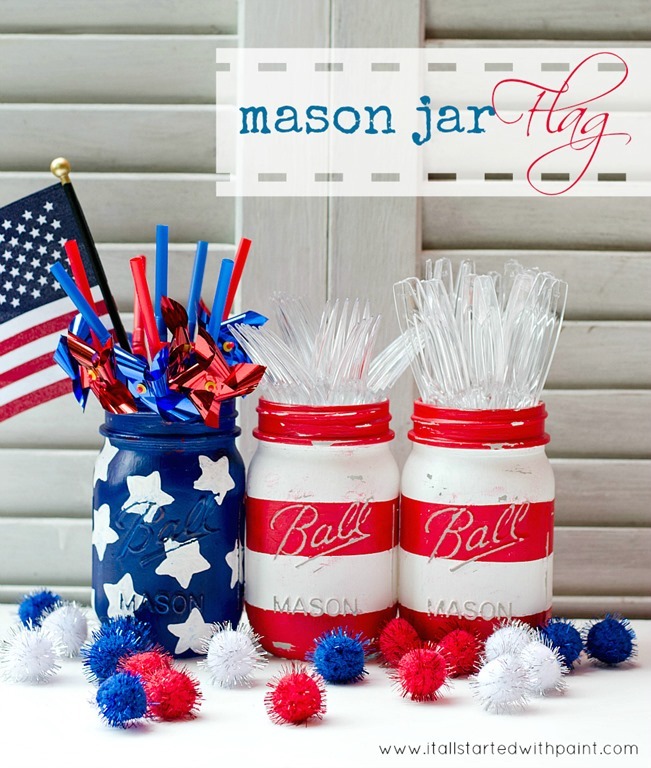 Tie clear mason jars with red and white stripe or blue with white stars ribbons and fill them with red, white and blue hard candy, mints or M&Ms. This holiday centerpiece turns the decorating inside out. Step 1: Use DecoArt Gloss Enamel paints to thoroughly coat the inside of the jars with paint. If you don’t want brush strokes inside, squirt the paint into the jar and then rotate the jar so the paint coats the inside evenly. Step 2: Once the jars are coated to your satisfaction, turn them upside down and put them on wax paper overnight to let the excess paint drip out. The paint instructions recommend allowing four days for drying and then baking the jars in the oven to set the paint. Once dry, pop in some festive pinwheels for a fun, patriotic look. These are just a few ideas amongst the infinite creative possibilities mason jars present. Let your imagination run wild and use these as inspiration for how to decorate with mason jars for other holidays or everyday life!